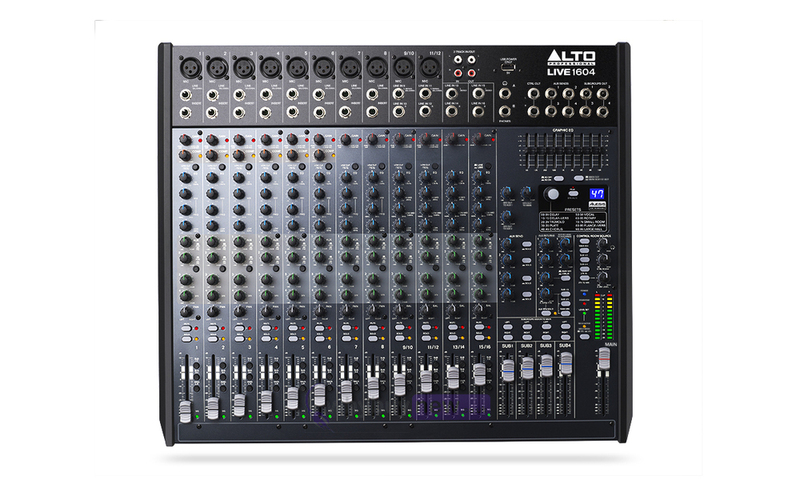 The Alto Professional Live 1604 is a pro 16-channel, 4-bus mixer equipped with the tools you need to create the perfect mix. With flexible routing options and a multitude of onboard DSP tools, Live 1604 fits the demands of nearly any live performance environment. 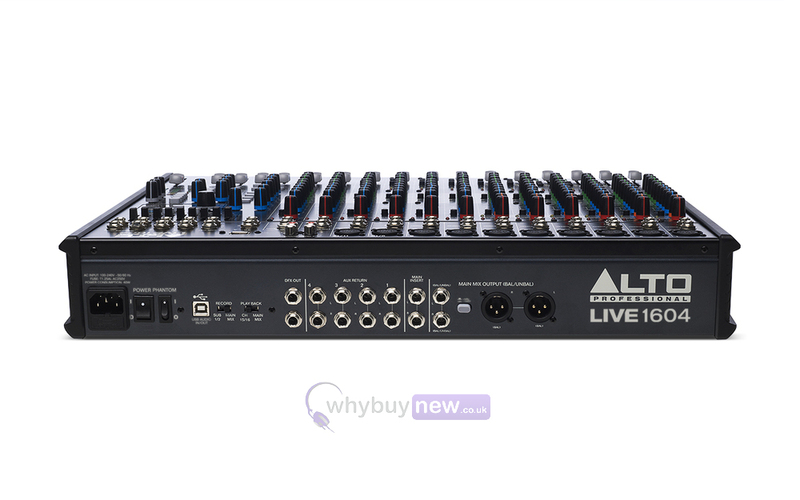 It features 10 balanced XLR inputs with switchable phantom power, 3-band EQs with sweepable mids for additional tonal shaping, four aux sends per-channel for external effects and monitoring, and a 9-band graphic EQ for main or monitor outputs. A headphone jack with an independent level control enables additional monitoring and mixing. 60mm faders with LED meters provide precise control and visual feedback for accurate, hands-on mixing. With its diverse connectivity options, Live 1604 can handle any sized event from small coffee house gigs to mid-sized ensembles to full-stage rock bands. Live 1604 offers high-fidelity sound and high-quality DSP tools in a single package. Each microphone channel is outfitted with a high-headroom ultra-low-noise DNATM microphone preamp for unprecedented sound quality and a robust audio signal path. Live 1604's high headroom results in cleaner mixes, a purer signal path, and loud, punchy audio. Onboard analog compression (channels 1-6) helps control dynamics and gel instruments together for a cohesive, defined mix. With high headroom, pristine sound, and built-in dynamic control, Live 1604 ensures that the full dynamic range of your mix comes across with striking clarity. Record your mix directly to a Mac or PC with a single USB connection. Live 1604's built-in USB port allows engineers, producers, and performers to convert two channels of 24-bit audio (Main Mix or Sub Mix 1/2) straight to a computer. Record live performances, band practices, theater performances, speaking events, and any other live sound event onto your computer for additional editing, mixing, and post-production. The USB connection is bi-directional, enabling sound files stored on your computer to be streamed to and played through Live 1604. 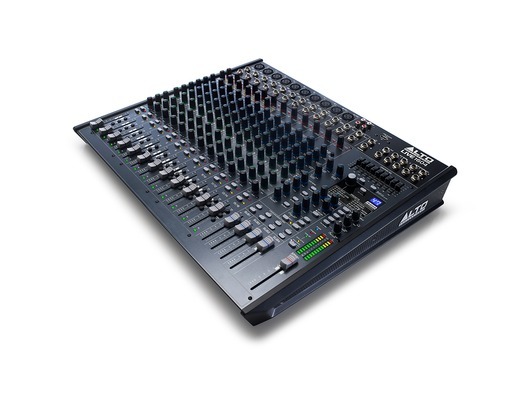 Live 1604 comes ready to handle any mixing situation with premium 24-bit Alesis effects built right into its design. Select from 100 DSP effects that give you additional creative control in any mixing environment. Choose from room and space delays, small and large hall acoustics, plate and spring reverbs, flangers, choruses, and more. The effects presets make it easy to dial in your favorite sound or experiment with different effect settings on the fly. Often, live sound environments are dimly lit and offer poor visibility to the mixing engineer. Live 1604 solves this problem by color coding each section of the mixer and providing brightly colored knobs so you can quickly and easily find what you need to adjust. Blue, green, red, yellow and white pots are instantly easy to identify in low lighting. LED indicators for output level, peak, and phantom power also assist in making sure that you have multiple visual cues that reflect everything you're hearing. 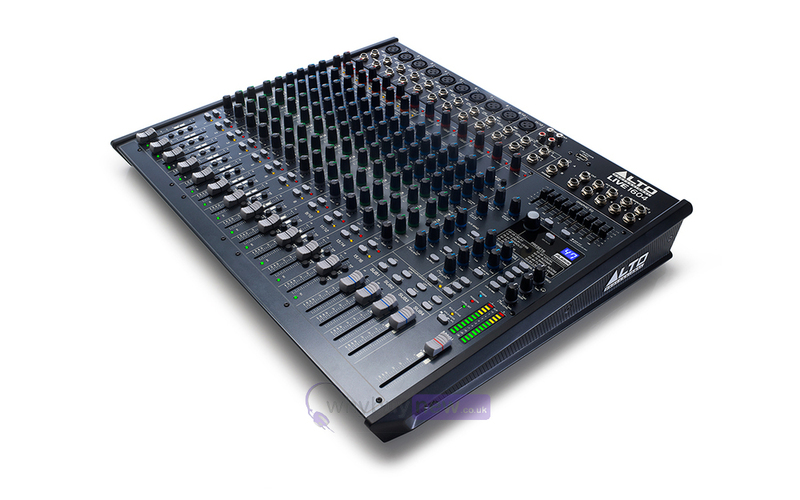 Here we have the Alto Live 1604 Mixer in brand new condition and in B-Stock. The B-Stock versions would have been on display at a training evening or trade exhibition only and will come boxed 'as new' with all accessories and a 1-year warranty.